A new take on low calorie tuna salad recipes, this Tuscan Tuna Salad has some wonderful new flavors, and no mayo. It gives a lot of bang for it’s buck with each 1 cup serving coming in at just 5 Points. 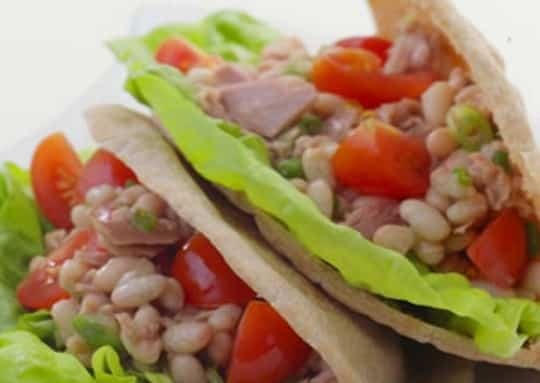 Serve it over a bed of fresh greens, or in a low calorie whole wheat pita for a delicious and healthy lunch recipe that tastes incredibly light and fresh. It also works great served on whole wheat crackers an appetizer. Make it in advance and store in the refrigerator for up to two days – it’s great to have on hand for a quick and easy meal when you don’t feel like cooking on a hot summer day. Enjoy! Try out a new take on a traditional tuna salad recipe that will have you forgetting you are counting Points! This delicious Tuscan Tuna Salad makes the perfect quick and healthy lunch idea for any hot summer day. With just 5 Points per each 1 cup serving, this dish will leave you feeling satisfied while still staying within your daily Points range. Combine all ingredients medium bowl. Stir gently. I want to try this recipe! It sounds delicious. I’m not sure if I have the white beans in my pantry. I know I have black beans…….may use those with a Mexican twist!